I often run down Linwood Ave and pass by Canton Square at least a few times a week and so I was delighted when Stacy told me about a new exciting cupcake and frozen yogurt place moving onto the square! Frozen yogurt, like anything else sweet and delicious, is just one more thing that this Crusader loves, so last week I stopped by the new little “frozen yogurt, cupcakes & more” shop called Cup Love. It was busy when I got there (the photo above was taken as they were about to close and the shop had emptied out), so I took a minute to look around and discovered it is a “serve yourself” style frozen yogurt bar, with 8 different types of frozen yogurt to choose from and every “fixin” you could ever imagine wanting! And of course, there were cupcakes in adorable little cake stands on the counter near the register. While I was taking it all in, one of the owners stopped and asked me if I needed any help or wanted to try any of the yogurt flavors. I introduced myself and was then introduced to the other owner, artist, sign maker, and cupcake baker! They were very gracious and welcoming, as they were with every customer. After talking about how it all worked, and trying a couple of flavors, I decided upon Dolce de Leche for my frozen yogurt with pieces of banana toffee cupcake on top and just a bit of peanut butter frozen yogurt on the side. It’s paid for by weight, so the more yogurt you want and the more toppings you add, the more it will cost, but my yogurt concoction was just over 3 bucks, making it very reasonably priced! And the taste – OH MY! 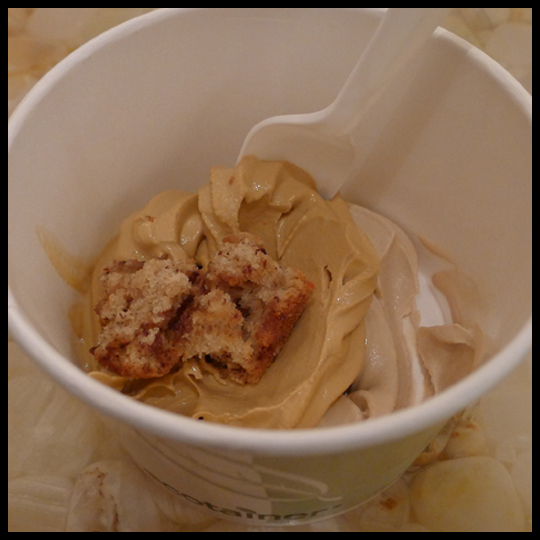 The yogurt was creamy, flavorful, and delicious! The cupcake pieces on top really added a nice texture and flavor as well. While I thought the cake was slightly oily, it was also spongy and had a sweet, subtle flavor. The icing was amazingly citrusy and tart – the perfect complement to the more subdued cake. Together they created a very nice and refreshing cupcake that I look forward to eating in the hot summer months ahead. First of all, this cupcake was HUGE – so large that I split it up to share with some of my co-workers! The cake alone was a bit plain, but it needed to be so that when eaten with the icing and ganache together it all isn’t too sweet. Yes, I said icing AND ganache. 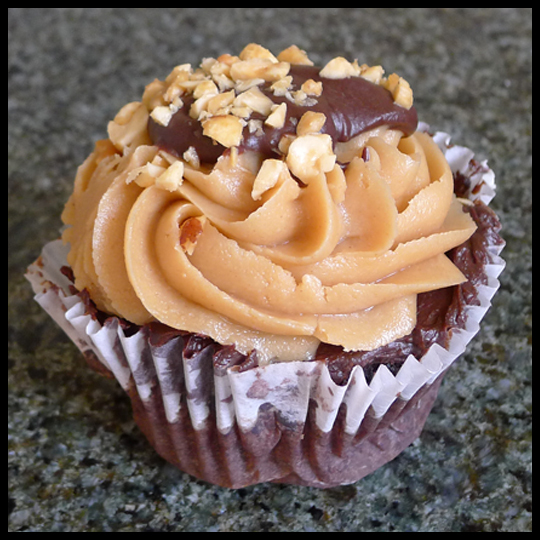 The peanut butter icing was smooth and sweet, and the chocolate ganache melted in your mouth. The chopped peanuts on top added the most fantastic texture (just like when you add them to a frozen yogurt sundae, hint hint) and I loved the hint of salt I tasted too. Definitely a cupcake to be eaten again, but it will have to be shared as it is so large. Moist and simple, the cake alone was very classic… then I tasted the icing. Immediately, I was whisked away to long ago summers at my Nona’s house and being in her kitchen, stealing a spoonful of her buttercream icing out of the fridge. While not exactly the same – Nona’s buttercream doesn’t have any marshmallow in the recipe – it is so very close and so very delicious. When writing my notes on this cupcake I wrote, “Fluffy, smooth, sweet, & buttery, don’t really taste any marshmallow, but I don’t care about that one bit.” That just about says it all. 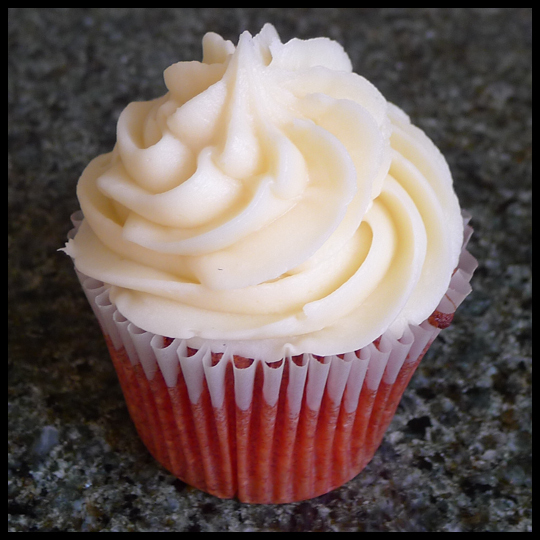 As you all know, I am partial to red velvet and enjoyed Cup Love’s take on this classic cupcake. The cake was on the drier side, but that’s almost expected with red velvet. 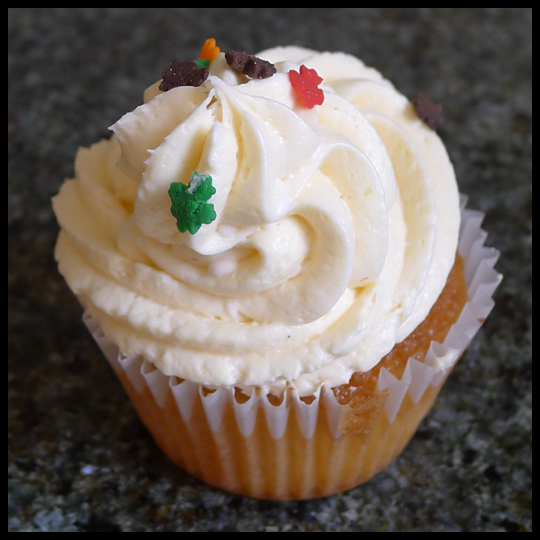 The cream cheese frosting was smooth and creamy, sweet and savory… it didn’t taste like traditional cream cheese icing, and I kinda love that! FANTASTIC. It’s the only word I can use to describe this cupcake. The banana flavor was superb without making it taste like a muffin, which I have found is an issue with banana flavored cake. The toffee was a sweet addition that didn’t overpower the moist banana cake. 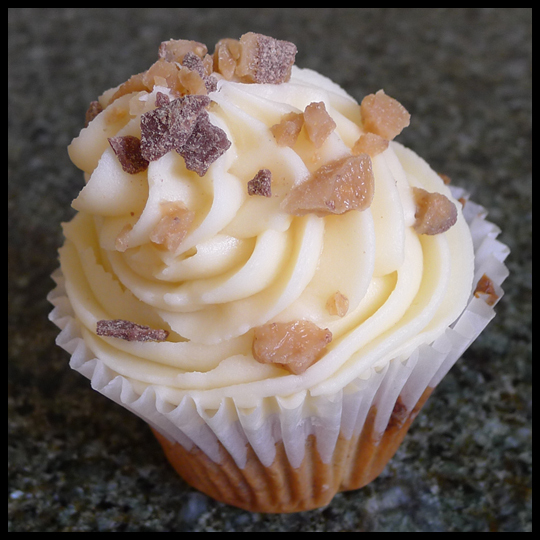 The not-too-sweet cream cheese icing was perfection and the toffee bits on top added a whole other texture to love! My favorite of the cupcakes, I will be ordering this one again and again. My first experience with Cup Love was phenomenal to say the least. 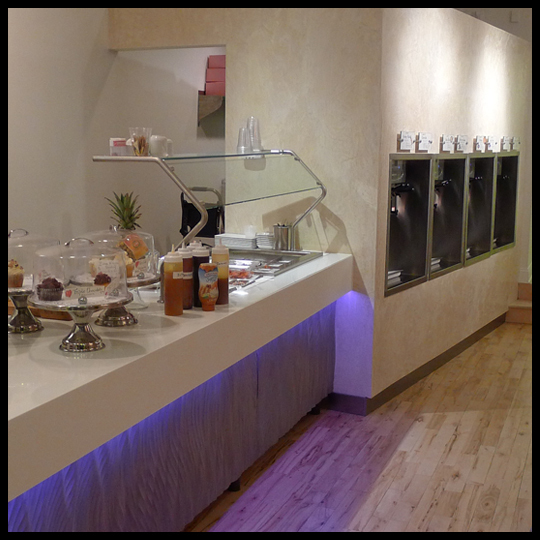 The owners have to be some of the sweetest and most welcoming people I have ever had the pleasure of meeting and their vision for a “fix-your-own” frozen yogurt shop is the perfect “icing” on Canton Square. They are always working on tweaking the cupcake recipes to perfection, and thinking of new and interesting toppings for the frozen yogurt. I highly recommend going, creating your own frozen yogurt concoction, and taking a cupcake home for breakfast the next day. I already decided I’ll have to start carrying a couple of dollars with me when I run so that I can stop by on my way home and reward my running with some refreshing frozen yogurt, topped with cupcake of course! Have you been to Cup Love? What did you order? AND what should I try next?! This entry was posted in Baltimore, Cupcakes, Maryland and tagged banana toffee, buttercream, Canton, Canton square, Cup Love, Cupcake, Dolce de Leche, frozen yogurt, lime, peanut butter, Red Velvet, vanilla by Crusader Elisa. Bookmark the permalink. 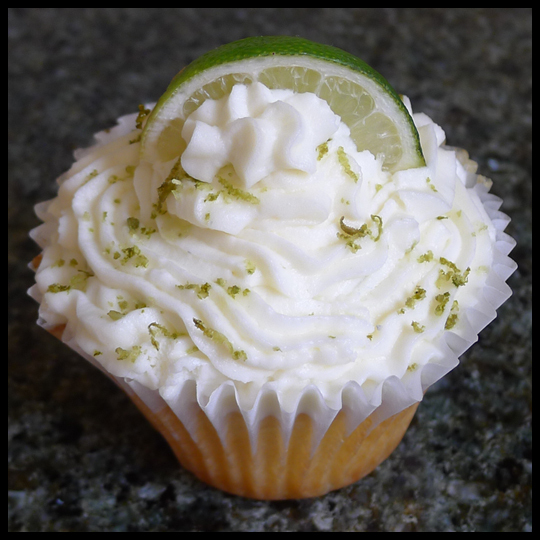 Wow – that lime looks sublime. I really enjoy your blog, I now feel in the know in the dessert world, lol. Haha! Thanks Lauren! We are happy to be a part of that. If you ever stumble across a place you haven’t seen on our blog, please let us know! We love recommendations!